I made this card for Our Creative Corner - Sketch Challenge. Sentiment is not added yet though. 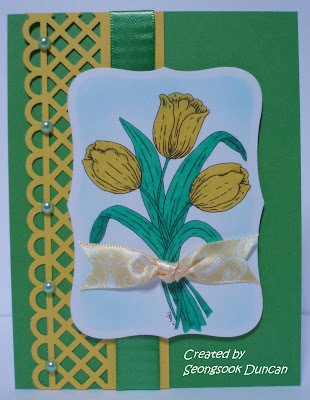 I also enter the Fred She Said Challenge for March - Very Springy card. I used the digital Image "Tulip Trio" that I colored in yellow. I already made some in red for the Operation Write Home. The original digital image is from Fred, She Said Designs that was donated to Operation Write Home cardmakers. I used my new MS deep border punch for this card which is cool. Simply beautiful card!!! Love the pretty spring flowers. Perfect card for a wonderful cause!!! LOVELY! What a great color combo for this digi image! I really like your tulips. I think it is such a sweet image, and can be used on so many cards. I purchased one of the paper piercing images. If you'd like to check it out, I entered it at FSS, also. I love the colors you used on this card (also layout and punched embellishment). Beautiful tulips...my favorite flower. You have followed the challenge perimeters to a tee and created this lovely card. I love this FSS image in yellow. Your punches paper accent looks awesome. Thank you for playing along with us at the Fred She Said Challenge this month. Looking forward to seeing you again for the next challenge.